Radionuclide generators offer a cost-efficient way to produce positron emitters for positron emission tomography (PET). A radionuclide generator produces continuously the desired radionuclide by means of nuclear transformation from a longer-lived parent nuclide and can be separated from it by suitable radiochemical methods in high radiochemical purity. After separation the daughter nuclide can be used for labeling. The most important example of the widespread use of generator-systems is the 99Mo/99mTc-Generator. By far 99mTc is the most important radionuclide for SPECT and can be used for investigation of brain, myocardium, thyroid, lung, liver, gall bladder, kidney, bone, blood and tumor. Important β+-emitter-producing radionuclide generators for PET are 44Ti/44Sc, 62Zn/62Cu, 68Ge/68Ga, and 72Se/72As 82Sr/82Rb. The use of radionuclide generators provides the possibility to produce the daughter with n.c.a (no carrier added) conditions. Therefor with this nuclide labeled radiotracers can be used in concentrations which have no pharmacodynamic effects on the organism. (~ 270 d) and that of the daughter (67.7 min), are suitable for use as PET nuclide. The half-life of the parent is sufficient to use the generator for 6 to 9 months for routine production and the balance between parent and daughter is fast enough restored to elute the generator several times a day. The half-life of 68Ga also allows multistage labeling and measurements over a longer period of time. The main reason for extensive application of 68Ga in medicine is the volume after elution of the generator and the chemical form in which the radionuclide is present. In addition, impurities from the column material play an important role. Today different commercially obtainable generators can be used for labeling reactions with 68Ga. An important point concerning the choice of the generator is the “post-processing” of the generator eluate, which should allow an efficient separation of interfering metallic cations to get high radiochemical yields in the following labeling reaction. Hence, some projects in our group are dealing with the optimization of the post-processing, to remove the interfering impurities in a fast manner, without losing noteworthy amounts of 68Ga-gallium. Using these optimized purification strategies previously existing problems in the manufacture of 68Ga-tracers could be eliminated and routine examinations are made possible with 68Ga-peptides. Reduced eluate volume, low germanium breakthrough, pH optimization and separation of impurities guarantee large, carrier-free 68Ga and high specific activities in subsequent labeling reactions, thus even small amounts of precursors for syntheses are sufficient. Another generator-produced nuclide with excellent properties for PET is 44Sc. The half-life of 44Sc is with 4 h significantly longer than that of 68Ga. Thus qualifies 44Sc for applications with long biological half-life and could be used in the endoradiotherapy for more accurate planning and dosimetric calculations. Other advantages compared to 68Ga are the higher frequency of β+-decay (94.27%) and transformation into a stable, non-toxic daughter (44Ca). The half-life of the parent is sufficient to operate the generator for years and the balance between parent and daughter is fast enough restored to eluate the generator once a day. In addition multi-level labelings and measurements are possible over a long period of time. As well as for the 68Ge/68Ga-generator an efficient purification strategy for the eluate is important to separate potential impurities from 44Sc. Likewise the post-processing is cation exchange-based and can be carried out within a few minutes without much effort. After elution, the generator is eluted with the same eluate composition in a reverse way in order to preserve the long term stability of the generator. After all we can obtain a highly pure 180 MBq 44Sc-fraction in a reduced volume of about 3 mL within 25 min. Up to now the 44Ti/44Sc-generator is not commercially available. There exists only one prototype, which was developed and evaluated here in Mainz and is used for research purposes. Fast progressing of immuno-PET asks to explore new potential radionuclides. One of the promising candidates is 90Nb. It has a half-life of 14.6 hours that allows visualizing and quantifying processes with medium and slow kinetics, such as tumor accumulation of antibodies and antibody fragments or drug delivery systems and other nanoparticles. 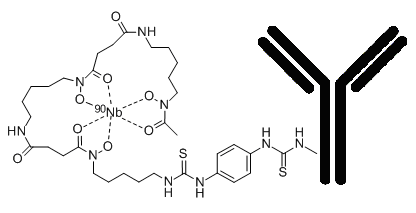 Efficient radionuclide production routes and Nb(V) labeling techniques are required to turn this radionuclide into a useful imaging probe. Our initial results allow us to produce high batches of 90Nb (>10 GBq) by proton bombardment of a zirconium target. For labeling application, no-carrier added 90Nb must be separated from the irradiated zirconium target. Hence, a separation strategy with a two-step procedure was developed, which took no longer than 90 minutes and gives the decontaminated 90Nb in a more than 95% yield. To attach metallic radionuclides to biomolecules in most cases appropriate chelator agents are required. In case of the 90Nb, desferrioxamine is the chelator of choice. Labeling of such a functionalized monoclonal antibody (rituximab) with 90Nb showed high labeling yield (> 90%) and a high in vitro stability (> 95%) for 5 days of incubation in fetal calf serum at 37 °C.